I'm playing a charity gig this Sunday; do you want to come? The short version: I'll be playing my first gig in 5 years this Sunday. You can save money by buying tickets in advance, via this website, or just buy them on the door on Sunday, from 5 pm. Naturally, it would be amazing to have some support - and you'll be guaranteed something very exclusive; not only will I have a full band, I'll also be playing a set of original songs that have never been played live before, most of them from my upcoming album. It's been a while since I last played a gig with a band. In fact, it's been more than 5 years. Since then, I've only played one other gig, and that was just me and an acoustic guitar, playing mostly covers. It's fair to say I've been "out the game" for a while! 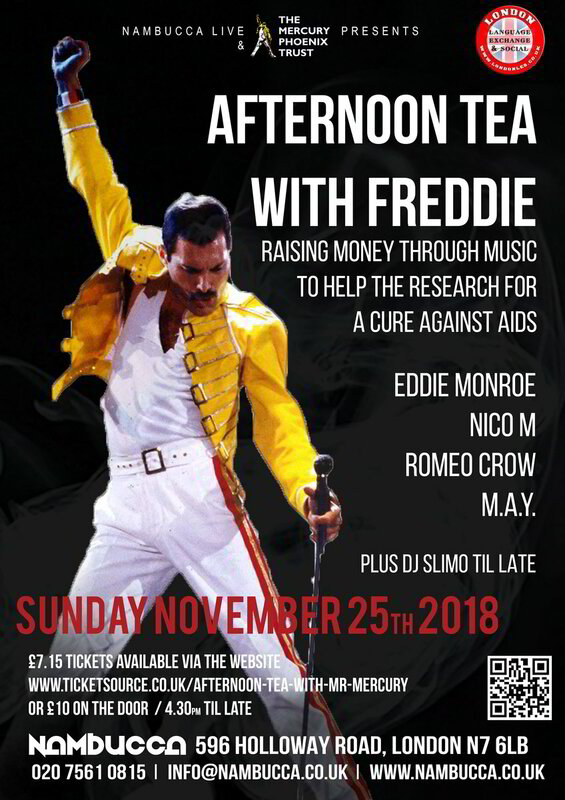 So, when Eddie Monroe (a lovely guy with an exceptional voice and range - think Freddie Mercury and you're in the right ballpark) called me to say he was putting on a charity gig, in aid of the Mercury Phoenix Trust and wanted me to be their main support act, I... panicked! I would be playing my own songs. I haven't done that in years. I wanted them to be mostly from my new album; the set-list would be songs I've never played live before (nor knew how to play, even just on my own at home). I knew I wanted a full-band for them... but I didn't have a band. I was going to be playing for 35-40 mins, and I didn't know if I'd have the vocal stamina for it. But, with some wonderful, and much needed, encouragement from my wife, I agreed. And then instantly realised what a mammoth task I had ahead of me. Fast forward to today and the gig is this Sunday, and I'm not sure I'm "ready". I had to (re)learn all my songs, both the lyrics and the music (especially the music!). Since I'd recorded them all myself, everything was done bit by bit, part by part; I'd never played any single part all the way through. Nor did I remember how to play the parts. So I had to listen back to them all again, isolating each part, and working out what it was that I actually played. Even more challenging was working out how to play those parts... whilst singing the vocals. Then I had to put a band together. So, I put a message on Facebook and, thankfully, a few musicians graciously agree to come and help me play the gig for free. Next was trying to organise some rehearsals. In that time, we've not played any of the songs from start to finish. Suffice it to say, I don't really feel properly prepared! But, you know what? It's going to be fun. I've enjoyed so much playing my music with other musicians again. Having live drums, another guitar player and a bass underpinning it all has helped me re-discover something I'd lost; my love of playing music live. I've been so caught up in doing stuff on my own, at home, bit by bit, whether that's with my music or just family life and being a parent, that I'd forgotten what got me into music in the first place; rocking out!! And so, this Sunday, no matter how unrehearsed we might be, we are going to go out there and give it our all, we're going to play with abandonment and we're going to have fun. Most importantly; we are going to make it fun for everyone in the audience! So, if you're about in London this Sunday, please come down to Nambucca, in Holloway, at 5pm and join us for a good cause. And let's have lots of fun together!